Symbolism was a part of every day life for the people of central Mexico. Symbols were used in writing, in keeping time and dates, in names and titles, on buildings and in artwork, and even in clothing. It identified and explained the gods, showed social level, and foretold good and bad fortune. In keeping with the culture of the Aztecs, much symbolism was focused around religion and war. The gods were portrayed, as were warriors and battles. These things were portrayed using realistic human forms, as well as forms of nature. For example, jaguars, snakes (rattlesnakes were a favourite), dogs, birds and even insects were common. The human forms have come to be known as a defining characteristic of the Late Postclassical period in central Mexico. Of course, these things often had various meanings intertwined. There were basic meanings for animals, for example, that would grow in complexity as they came to represent gods or a warrior class. The frog represented joy. Butterflies symbolized transformation. The monkey represented dance and celebration. Combined with other symbols, a rich story could be told. The peoples of central Mexico used several different methods to express ideas in writing. One method was rich in symbols - ideograms. Ideograms (or iconographs) basically used symbols that everyone understood to express ideas. For example, a warrior brandishing a weapon standing over a kneeling unarmed warrior would be a symbol of conquest. Footprints may represent a journey or the passage of time (depending on the context). A speaking tree would represent the city of Cuauhnahuac (now Cuernavaca). A snake may represent a ruler, such as Itzcoatl. Learn more about the symbols of the Aztec alphabet here. When most people think of symbols, they think of the famous "sun stone", more properly the Cuauhxicalli Eagle Bowl. This giant representation of a calendar is not just one symbol but a collection of them, which would have been very familiar. It was very important to know, for example, what symbols were connected to the birth of a new baby. The signs on the stone actually represent gods. For example, the rabbit (tochtli) represented Mayahuel, the goddess of fertility. 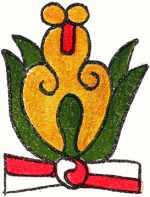 The flower (xochitl) represents Huehuecoyotl, the god of storytelling and dance. The numbers on the calendar also represent gods. For example, the number 7 represents Centeotl the god of maize (corn). Here's a great overview of all the Aztec symbols on the calendar. Here's a basic summary of how the Aztec calendar works. These symbols were a basis for a rich tradition of art, which we won't get into here. Here's a summary of Aztec art. Another defining form in the empire were masks, also rich in symbolism. Aztec symbols were everywhere, big and small. You can actually find symbols in pretty surprising places. It is believed, for example, that many Aztec temples represented mountains or sacred hills. The famous Aztec ball game, ullamaliztli, represented the battle between day and night, and important religious concept that drove the battles and sacrifices in the empire. 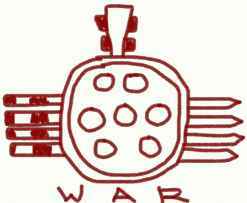 Warriors would wear clothes representing the group they belonged to, such as eagle or jaguar. Even the baby being born was considered a religious symbol. The baby was a "captive", struggling to be free. Everywhere you looked, one thing represented another. And what about the famous symbol on the Mexican flag? Did that come from the Aztecs? Click the link for the surprising story of the flag.